New 4-day packages are here for Easter! It's that time of the year again to visit grandma and grandpa with a nice car... or flee with your boo out of the city! This Easter Special, you get to enjoy a bigger range of hourly and daily packages. From April 13 to 28, 2019, enjoy quality time with an even bigger carsharing fleet of smart, Mercedes Benz, BMW* and MINI vehicles -- all for the same reduced prices! How much do car2go packages cost? Note: You may drive outside the Home Area, but you must come back to the same Home Area to end your trip. 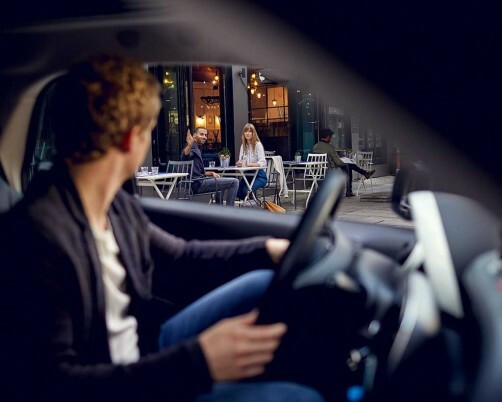 What happens if I drive over the number of included kilometers in the car2go package? It's not a problem if you drive more kilometers than are included in the car2go package. When the kilometer limit of your car2go package is reached, the long distance fee of 0,29 € for each additional kilometer is applied. For example: If you book a 2-hour package, which includes 80km, and you drive 90km, your trip will cost 2,90 € on top of the package price. What happens if my trip lasts longer than the car2go package? It's not a problem if your trip lasts longer than planned. After you reach the limit, the average minute rate will kick in. The average minute rate is what you pay for cars in areas where availability is balanced. For example: If you book a car2go for 1 hour, exceed the package by 10 minutes, and the average minute rate for that car is 0,24 €/minute, your trip will cost 2,40 € on top of the package price. Yes. You can book a car2go package after reserving a car2go as well as before starting your trip in the app. At the moment, it’s not possible to book car2go packages further in advance. What happens if I do not use up my car2go package? When you purchase a car2go package, the package price is charged to your account as soon as your trip begins. No partial reimbursement will be made if you end the trip before the booked package period expires. Can I book a package using car2go credit? Sure! It's really simple. If you already have credit on your default payment profile, it will be automatically used up to pay for your selected car2go package. The best part? You can use your credit to pay for packages in all car2go cities in your country. How do I make a stopover during my car2go package? When you book a car2go package, the car2go is reserved for you during the entire package time period. This means you can stopover at any time, take a break, and continue driving later. 2. Important: During your stopover, don’t end your trip in the app and don’t leave the ignition key in the car2go. Otherwise, your car2go package will no longer be usable. 3. Take the ignition key with you when you leave the car. 4. Don't forget to lock the car! Your rental will continue to count as part of the car2go package. Where can I book a car2go package? car2go packages can be found in the car2go app. Just find a car2go close by, reserve it, and you're ready to start. After you find and select a car2go, you’ll automatically see a list of car2go packages next to the minute price. There are different packages available in each car2go location. Just pick the most suitable package for your needs. Your chosen package will be displayed once again before the booking process begins. You can then start your trip. * To be able to rent the MINI and BMW models, it is necessary to register for DriveNow Italy s.r.l. and to use the DriveNow app. The minimum age for registration with DriveNow is 21 years. When registering and using the services of DriveNow, the general terms and conditions and prices of DriveNow GmbH & Co.KG apply. All prices include VAT. If you have any questions, please contact DriveNow Customer Service. ** The discounted prices for the car2go packages are available only during the promotional period from 13.04.2019 to 28.04.2019. You can find all the additional costs and fees in our Fee and Cost Policy.